This is a summer time observing project, it uses the wide field image as an index to the telescopic views. 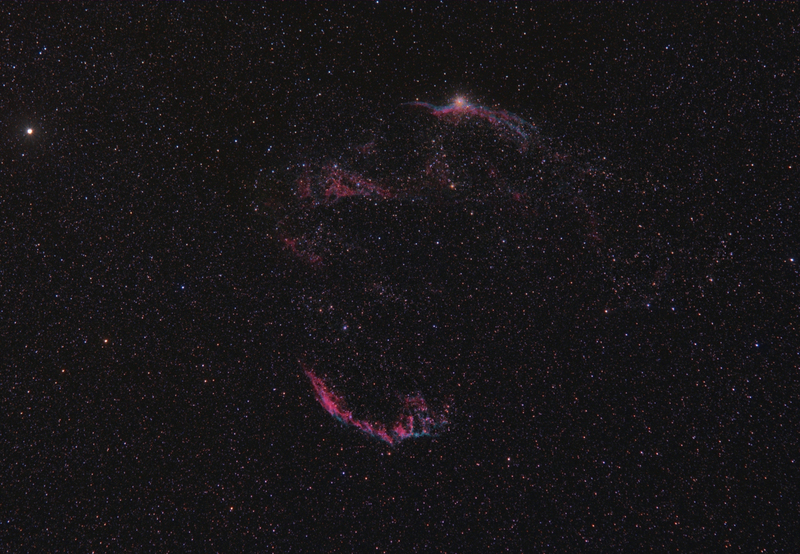 The telescopic images cover both main arcs and the central portion seen in the wide field image below the arc surrounding 52 Cygni. Move your mouse over the brighter sections to see a telescopic version . Canon zoom lens set to 165 mm focal length at f/5.6. Processing Calibration, stacking, arcsin stretch, masked contrast enhancement, high pass filtering, masked star reduction in Images Plus 5.5. Image binned to resize for web display in Images Plus. Masked saturation boost in Images Plus.